Experience modern luxury living with a twist at The Club at Emerald Waters when you call this lush resort-style neighborhood home. The Club at Emerald Waters is the perfect location, near many local small businesses, excellent shopping, and fine dining; it's close to everything you need and more. Enjoy living within walking distance of several local schools, eateries, and retail. Emerald Place is within 15 minutes of The Hard Rock Casino, Sheridan Plaza shopping center, downtown Hollywood, downtown Fort Lauderdale, and Hollywood beach. At Emerald Place, we've got you covered with a variety of community amenities to make you feel at home. Enjoy access to a 24-hour fitness gym, so you can work out on your schedule. We offer a pet-friendly environment with a playground, laundry facilities, business center, tennis courts, and more. Take advantage of on-site maintenance, online payments, and a sparkling swimming pool perfect for relaxing. Work hard and play hard with our premium business center. If you would like a sneak peek of our impressive community, take a minute to check out our photo gallery. The Club at Emerald Waters not only provides you with all the amenities you are looking for steps from your front door, but has specifically designed our well-appointed homes with you in mind. Come home to our spacious studio, one-, and two-bedroom floorplans featuring air conditioning, dishwashers and refrigerators, and cable/satellite capabilities. Our pet-friendly community also welcomes your furry friends. Be sure to view our pet policy to learn more. Have you found what you are looking for? 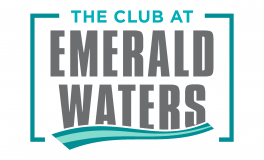 Apply online now to begin making The Club at Emerald Waters your new home today!